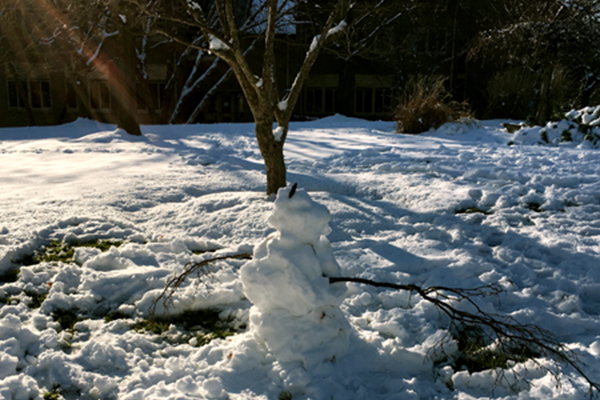 A snowman at Carnegie's Broad Branch Road campus following the snow storm of March 21, 2018. DTM, as well as most of the eastern U.S., saw the arrival of Spring come in the form of a snow storm. The cold weather, however, was no impediment for our hardy neighbors who showed up in large numbers for the first Neighborhood Lecture of the season presented by DTM Staff Scientist Peter van Keken. 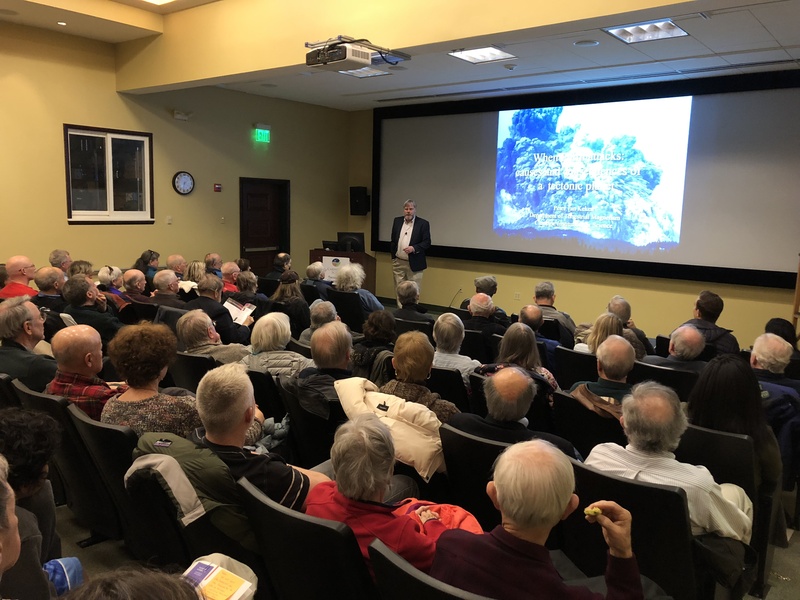 Attendees at Peter's talk, titled "When Earth Attacks: Causes and Consequences of a Tectonic Planet," not only overflowed the Greenewalt Auditorium, but also the overflow room in the Tuve Dining Hall. Using such materials as honey, peanut butter, and silly putty as solid Earth analog materials, Peter gave a wide ranging presentation of the forces that drive the movement of the surface plates and lead to volcanism and earthquakes along plate boundaries. Early in his talk, Peter included a discussion of the observations that led to the theory of plate tectonics, from the puzzle-piece fit of Africa and South America, to the reduced gravity above oceanic trenches, to the alignment of earthquakes along subducting plates to depths of many hundreds of kilometers into Earth's interior. Peter's own work addresses the cause of these deep earthquakes that occur at pressures where rock normally would not be expected to undergo the rapid fracturing that generates seismic phenomena. His models of the dynamics and temperature profile of subducting oceanic crust follow the metamorphism that changes the mineralogy of the downgoing plate. The increasing pressure and temperature in the plate as it descends into Earth's interior eventually leads to the release of large quantities of water carried to depth by hydrous minerals when they metamorphically transform to anhydrous minerals. Much like the shallow earthquakes caused by the reinjection of the waste water resulting from hydraulic fracturing methods for oil recovery, the water released at great depth by mineral dehydration provides something of a lubricant that allows rapid fracturing of the highly stressed rocks in the descending plate. Peter van Keken spoke to a full house of friends and neighbors. Click here to watch van Keken's Neighborhood Lecture via YouTube. 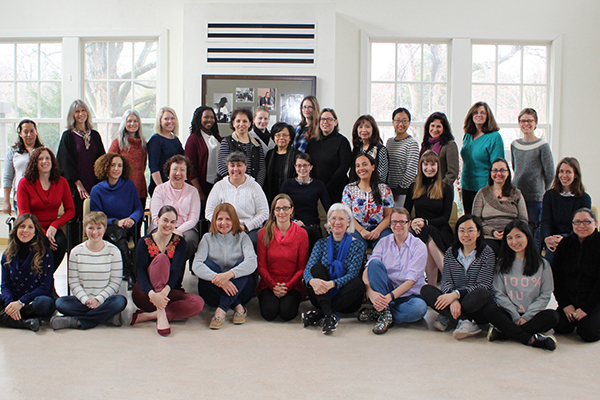 March 8 marked International Women's Day that helped remind us of the critical contribution made by women in all STEM fields, but particularly by the female staff of DTM. We are proud to have been the research home to luminaries like Vera Rubin, but before patting ourselves on the back too vigorously, we must note the many years that Vera was the sole woman on the DTM scientific staff. That brings us close to academic averages for our fields of science, but we should do better. The one employment category where we can claim some gender equality is in our postdoctoral fellows, where we have seen a steady rise in the ratio of female to male postdocs from 0.9 in 2000 to 1.3 today. Together with the Geophysical Laboratory, DTM celebrated International Women's Day 2018 on March 8. In my own field of radiometric geochronology, the person who discovered the phenomena of radioactivity that was then applied as a chronometer was Marie Curie, still the only person, man or woman, to have won Nobel Prizes in both chemistry and physics. That she did this in the early 20th century when STEM was not viewed as an appropriate career for women is even more impressive. I hope that we are entering a time when the barriers that stand in the way of women entering the STEM fields disappear so that we never have to suffer the possibility that the next Marie Curie, or Vera Rubin, is turned away from pursuing their passion for science. March marked the passing of two people with important connections to the department. Dr. Kevin Burke passed away on March 21. Kevin was a visiting investigator at DTM from 2000 to 2004 and made frequent visits thereafter. During his nearly 60-year career, he explored the geology of most of Earth's surface and its connection with the driving forces in Earth's interior. He was one of an increasingly rare breed of geologists that could recount, from memory, the geologic history of pretty much every important formation on Earth. Kevin was never shy about expressing his opinion, but it was always done with an enthusiasm for the subject and the desire to advance the knowledge of the way the Earth works. Mobility issues in his later years led him to the use of a chaired walker, but this only served to enhance his participation in poster sessions at scientific conferences where he would move his walker from poster to poster, then sit and have a prolonged discussion with pretty much every poster presenter present. His enthusiasm for our science, and his booming voice questioning from the back of meetings rooms, will be sorely missed. Also leaving us in March was Dr. Peter Ault Tinsley, an economist who taught at both Cambridge and the University of London and served on the U.S. Federal Reserve Board. For those readers familiar with DTM history, the name "Ault" is a clue to Dr. Tinsley's connection to DTM. Dr. Tinsley was the grandson of James Percy Ault, DTM Staff Member from 1904 to 1929, who commanded the research vessel Carnegie on several of its research cruises to map Earth's magnetic field. In 1997, Dr. Tinsley and his wife Marylee donated the personal papers of Captain Ault to the DTM archives. These papers provide a priceless look at the nature of scientific discovery at the turn of the century when field expeditions took staff away from the department for months to years. Dr. Tinsley was rightfully proud of the accomplishments of his grandfather. DTM is grateful to Dr. Tinsley for his long-running interest and support of the activities carried out at DTM and his contributions to filling in an important part of our history.